One of five stereo pairs in the Opus 2 line-up, the Wharfedale Opus 2-1 is a handsome beast to be sure and its pricetag seems surprisingly reasonable considering the high number of impressive bullet points on the features list. The most unusual of these, perhaps, is the midrange driver, which in this case is a 75mm soft fabric dome. 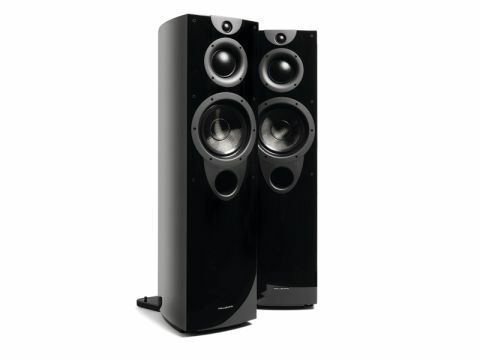 Such drivers – edge-driven by a very large diameter voice coil and looking a little like giant tweeters – are seldom found in domestic hi-fi speakers, but are well regarded in professional monitoring circles. The advantages of a dome midrange include exceptionally high power handling and the maintenance of reasonably consistent dispersion across the whole frequency range. Commensurate disadvantages, however, include the inevitable extra complexity of a three-way, and relatively modest sensitivity. Viewed from above, the generous and very solidly built boat-shaped enclosure has a slightly convex front and strongly curved sides leading to a very narrow back panel, all of which will help disperse internal reflections and prevent the focusing of horizontal standing waves. Our samples came in piano-lacquered black; lacquered real wood veneer finishes are also available. Beneath the dome midrange, bass is supplied by a relatively large 200mm drive unit that's equipped with a 150mm woven Kevlar cone and augmented by a large front port. Both dome units have textile diaphragms, the tweeter's being 27mm in diameter. A shaped and extended plinth ensures good lateral stability, and while the very substantial spikes are well founded and look very impressive, only thumbwheel locknuts are provided. Don't even think of locating these speakers close to a wall. There's ample bass output when the speakers are clear of walls here, with notable firmness and authority, to the point where the somewhat larger Opus 2-2 (2x200mm) and Opus 2-3 (2x250mm) models would probably have rather too much bass. Although the tonal balance is essentially impressively smooth and neutral, the overall character is certainly on the bright side, arguably tending to emphasise the presence and treble a little too much. As a result, the Opus 2-1 sounds exceptionally open and brings excellent intelligibility to voices, even at very low listening levels. The downside is that it does sound a little on the edge and can become a too aggressive when fed with the compressed and poorly mastered recordings that have regrettably become all too common in the iPod era. Paradoxically, in view of the massive boost in power handling promised by that large dome midrange, this means that the Opus 2-1 works best when not played too loudly. The hefty build and decent bass delivery endows the Wharfedale Opus 2-1 with real authority and impetus and the effectiveness of the cunningly shaped enclosure is reflected in an impressive 'disappearing' trick. While it could be faster, punchier and more dynamic, the firm, solid neutrality alongside a fine freedom from boxiness makes for a thoroughly entertaining experience indeed.